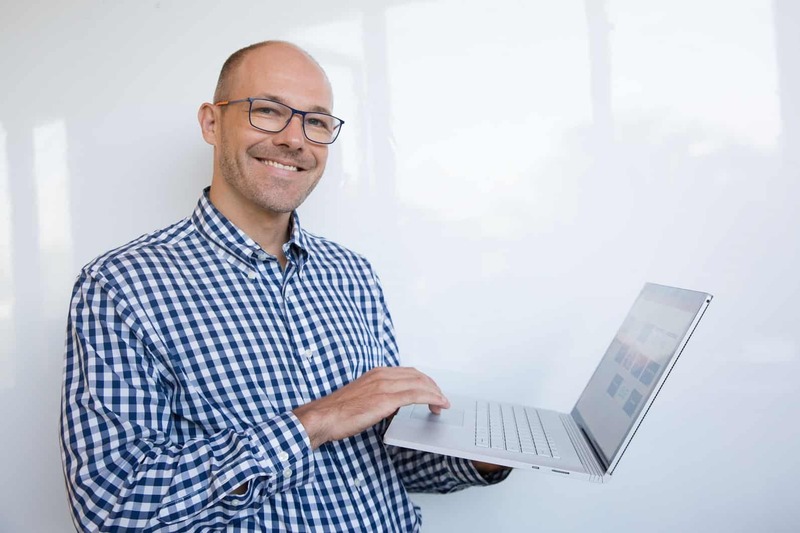 Creating a Venn diagram in any version of Microsoft Office (starting with 2007 and on) is extremely easy, thanks to the ever-handy SmartArt tool. In this tutorial, I’ll show you how to create a Venn diagram in PowerPoint in just a few clicks and then break it apart so that you can customize it to your heart’s content. I’ll then show you how you quickly break out the overlapping pieces of the diagram for even more customization! 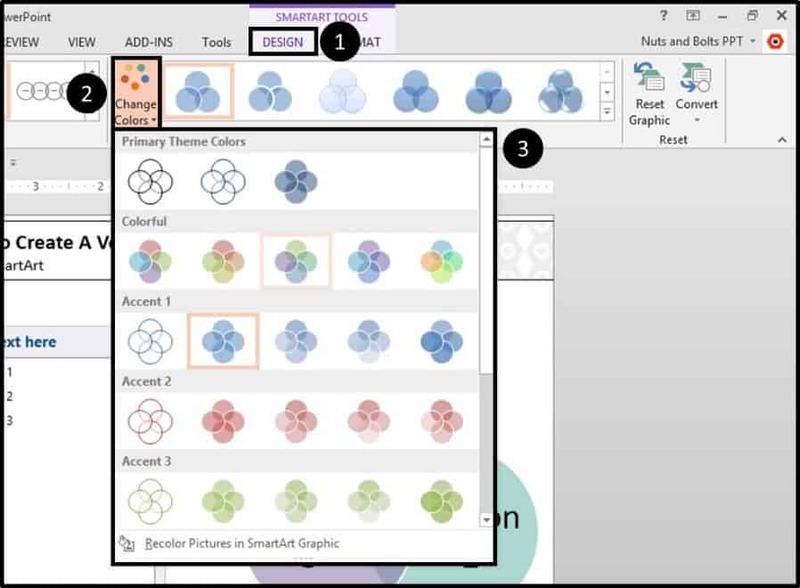 Watch the video below (or scroll down for the written tutorial) to see how to create, and then break (using PowerPoint 2013), a Venn diagram using SmartArt. 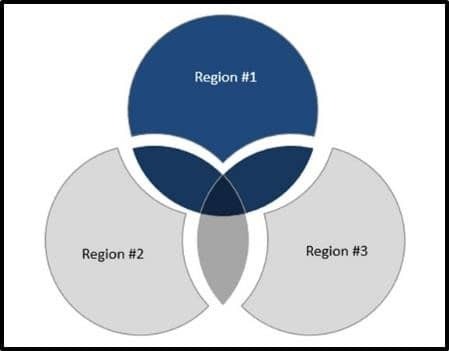 To see how to break out the overlapping pieces of your Venn diagram in PowerPoint 2007 or PowerPoint 2010, see how to make the center piece of a Venn diagram. 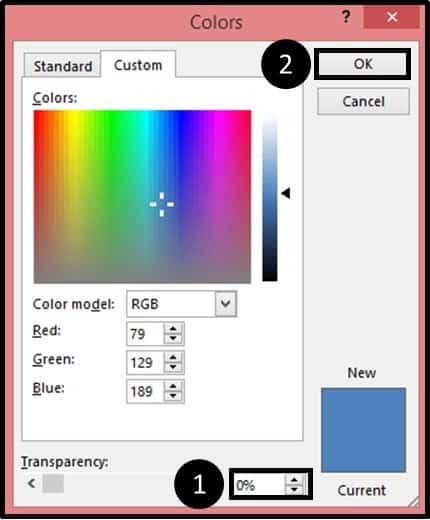 ​Navigate to the Insert tab in your Ribbon, find the SmartArt option and click on it to open up the SmartArt dialog box. In Microsoft Excel, it’s a smaller icon which you can see on the right in the picture below. ​Navigate to the Relationship tab on the left of the dialog box, scroll down to the bottom, select the Venn diagram and select OK, to insert the diagram into your presentation. If you don’t see it, click the little arrow on the left side of your diagram to open the text window. ​In the text dialog box on the left you can either type text or simply hit enter to add as many circles to your Venn diagram as you like (SmartArt makes this easy). 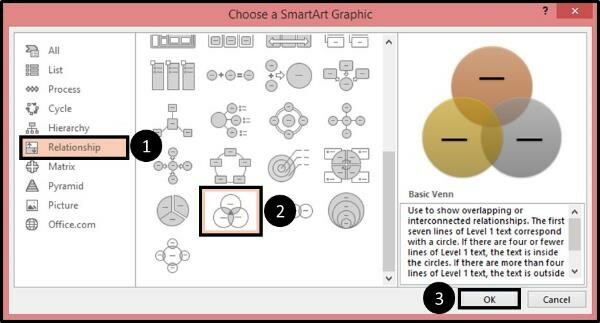 Using the SmartArt template you can quickly create a 3 part, 4 part of even 10 part Venn diagram in just a couple of minutes. 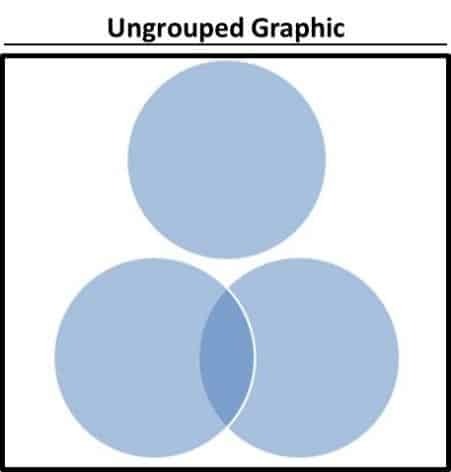 Venn Diagram Tip: If you are going to continue on and break out the overlapping pieces of the Venn diagram, it’s best not to include any text in the graphic at this point, as it will wonk out when we use the Fragment Tool in a minute. ​Before we break the Venn diagram apart in the next section, you can use the SmartArt Tools Design tab to further customize and/or format your Venn diagram. Once we break the graphic apart, these options will no longer be available to you. With your SmartArt graphic selected, hit CTRL + SHIFT + G on your keyboard twice…once to break the SmartArt, and once to ungroup the circles. The the graphic ungrouped, you are left with just three overlapping circles that have a transparency applied to them. In the picture below I’ve moved one of the circles up to prove that they are just circles (nothing fancy here). 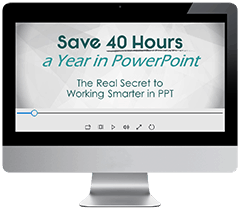 To see how to use the group and ungroup shortcuts in PowerPoint, see the short video below. 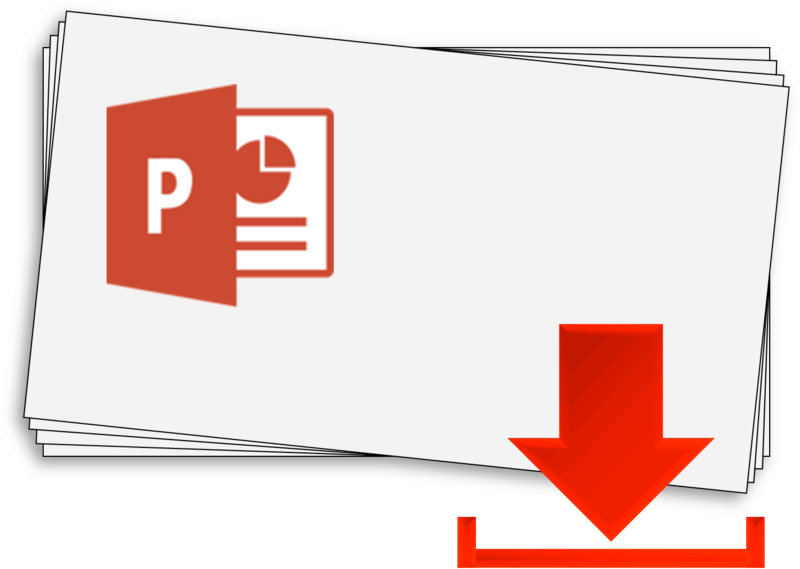 Note: To learn other useful PowerPoint shortcuts like the group and ungroup shortcut, see our PowerPoint shortcuts guide. Important Note: The Fragment Tool only exists in PowerPoint 2013. 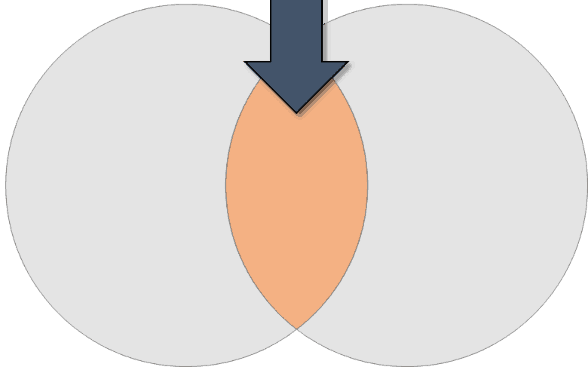 If you have an earlier version of PowerPoint, now is a good time to skip to our other post which shows you how to break out the center piece of a Venn diagram using the other versions of PowerPoint. 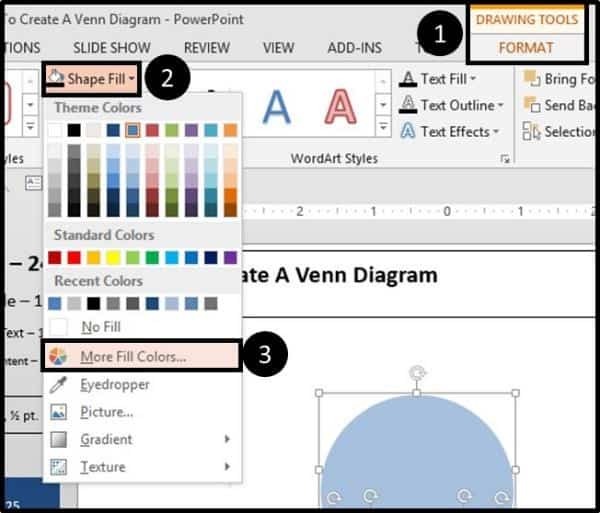 ​With the three overlapping circles selected in PowerPoint 2013, navigate to the Drawing Tools Format Tab, navigate to the Merge Shapes tool and in the dropdown, select Fragment. Doing so the three overlapping circles break into the seven individual pieces as pictured and numbered below. 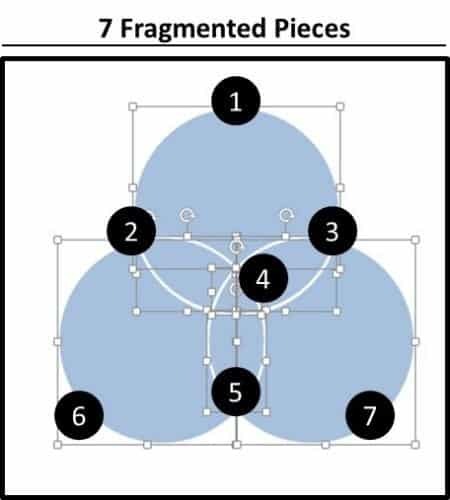 Obviously depending on how many circles you added to your graphic will determine how many individual pieces you are left with after fragmenting the graphic. With the pieces all broken out, next you’ll want to remove the 50% transparency that carried over from SmartArt. With all the pieces selected, navigate to the Drawing Tools Format tab, open up the Shape Fill dialog box and select More Fill Colors. In the dialog box that opens up, change the transparency setting in the lower right-hand corner to zero to remove the transparency and click OK.
That’s the beauty of breaking out the overlapping pieces of a Venn diagram! To see how to create this same effect in earlier versions of PowerPoint, see our tutorial on creating the center piece of a Venn diagram. Subscribe to get these Venn diagram slides & graphics on the house.